I wanted to share a little house tour with you, we have spent so much of our time creating a home in this quaint little two bedroom bungalow over the last three years. It has definitely not been easy and we have sacrificed a lot of family evenings and weekends to get things done. But it is finally complete. And we are ready to move on and to get a house that has more space for us. Sophia definitely needs her own room and I cant wait to give her that. We have been planning lots and she has a very clear idea of what she would like. 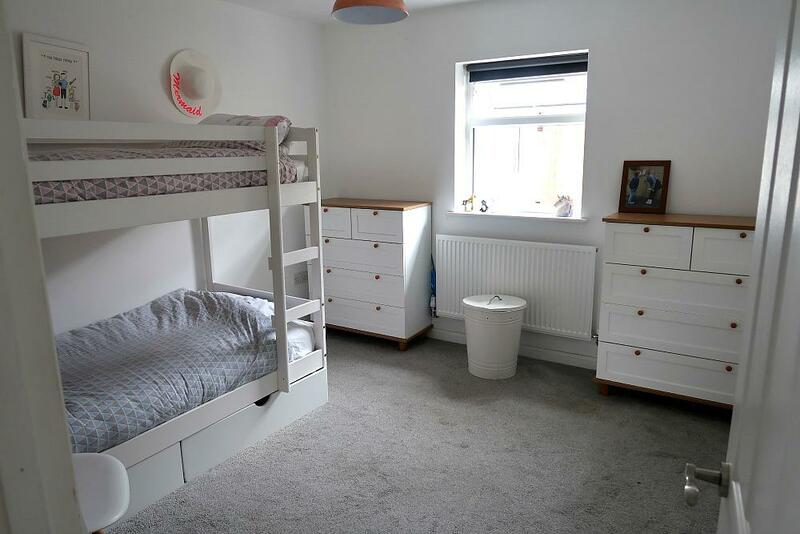 This is the children’s bedroom which was one of the easier rooms to do, as a few of you may already know this house is concrete so every wall needed to be stripped down and re boarded and re plastered before it could even be painted. So each room took us twice as long so it wasn’t a straight forward painting job at all. Daniel has done all of the work himself and has put so much effort and hard work in for us and he has made the house into a home for us. It feels slightly bittersweet that now we’ll be leaving. But we are ready to have a bigger home and we definitely need some more space. 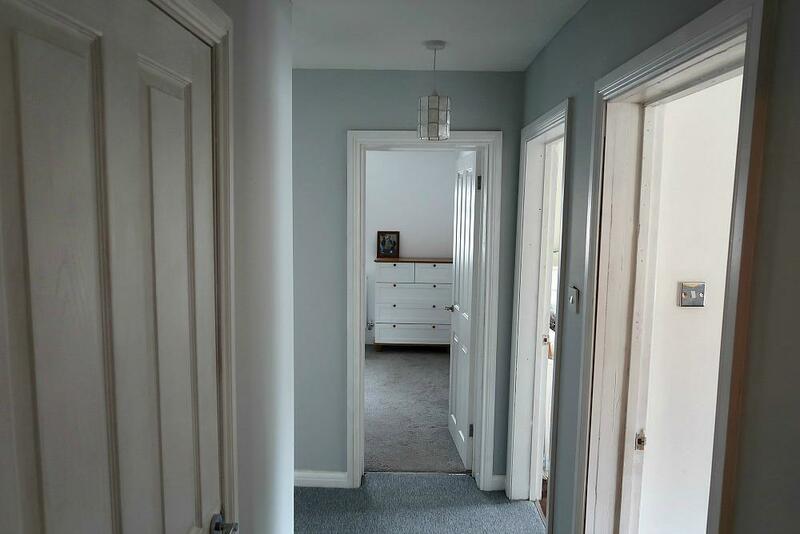 We used primed skirting board in the children’s room and in most of the rooms we decorated. It made it much easier for us, which meant it already had its first coat of paint so it was much quicker to get the room finished. The lounge was the first room we renovated. We took the window out and made double doors into the back garden, this was the best thing we ever did. We added a stove which we have made use of every winter and it makes the house so cosy and warm, and we re boarded and painted the room and added the beautiful oak shelves which I love so much. I especially love the photos we have displayed on there too. They are from Cheerz if you are wondering. 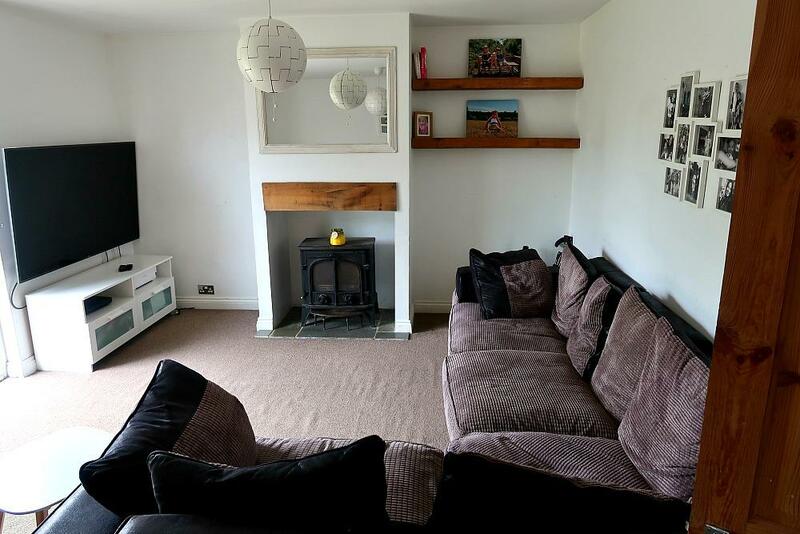 We were thinking of adding a little feature to the fireplace, we both loved the idea of brick tiles but as we are now leaving it will be up to the new owners. But its definitely something I’d love in our new home if we had a fireplace again. Which I hope we will. We really love the idea of brick tiles I think its lovely to make a feature of the fireplace, and really makes the room feel cosy. Perfect for a family room. And last but not least our lovely little hallway. Which we have only just completed we spent a lot of months (which felt very long indeed) waiting to finish it. 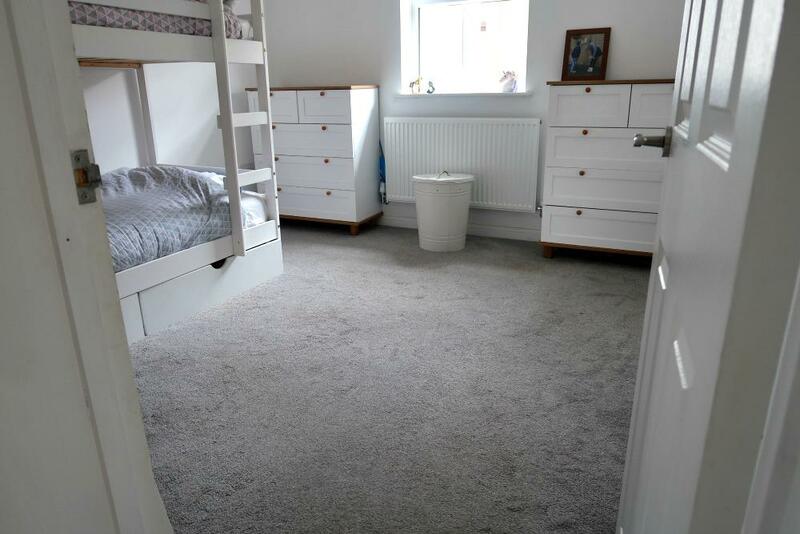 But we are really pleased that it is finally finished, and I still cant get used to walking on the wonderful warm carpet, and seeing the lovely fresh painted walls. We also renovated our bathroom and kitchen i’ve linked both so you can have a little look at what we did to both rooms. Do bare in mind that this was our kitchen before the dinning room extension, I still have not shared the dinning room/ kitchen extension on my blog. Its been such a journey and an amazing three years, we moved in when Archie was just over one years old and we have come so far here. Feeling very happy and content and excited for our new adventure as a family of five, well seven including out two cats!